← Should Assisted Suicide be offered to Criminals serving ‘Whole-Life’ Tariffs? 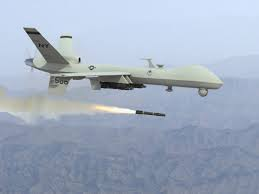 This entry was posted in Politics, Religion, Technology, War and tagged A Hard Rain's A-Gonna Fall, assassination, Bob Dylan, Reaper drom, Reaper drone, Reyaard Khan, Ruhul Amin, Syria. Bookmark the permalink. ‘Probably’? To move from a probability to assassination is quite a leap for a democracy which favours due process. And of course, now and then, people go on trial and are found Not Guilty after the evidence is tested in court. So on balance I disapprove of Reaper missile attacks on people who are not in a war zone and may/may not have committed a heinous crime. Though of course Michael Fallon was referring to a future crime- but the possible/ probable crimes he cited were against events which had already gone & were therefore unavailable for a crime to be committed. There was no prima facie evidence against either of these men.